If Sky didn’t die like everyone says, then where has she been for the last three months? Blackfin has always been a small, odd town. Even so, its residents still wonder how Skylar returned when everyone knows she fell off the pier and drowned on her 16th birthday. They even saw her corpse pulled from the water and later buried. No one wonders more, however, than Sky herself, especially since she recalls a different version of the events. Fans of Lisa McMann and Gail Giles will welcome this debut thriller that immediately grabs readers with an intriguing premise. When Sky’s parents seem reluctant to answer her questions, she seeks help from some unusual sources: her boyfriend, whom she may or may not have kissed the night she “died”; her mechanic father’s apprentice, who’s also the town’s only newcomer in years; the old gypsy woman in the woods; and even her own home, known as the Blood House as it was once a butcher shop…and possibly more. 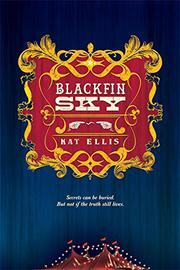 As Sky slowly discovers her family’s and town’s mysteries, she also realizes her own remarkable gift. Perhaps so too does a villain, drawn to her power for his own evil intentions. The plot-driven ending is less effective than the atmospheric beginning and suspenseful buildup of events, but by then, readers are already hooked.